Suggested Usage: As a dietary supplement, take 1-3 capsules each time, two times a day, or as suggested by a healthcare provider. Red Ganoderma is primarily composed of complex carbohydrates called water-soluble polysaccharides, triterpeniods, proteins and amino acids. Researchers have identified that water-soluble polysaccharides are the most active element found in Red Ganoderma that have anti-tumour, immune modulating and blood pressure lowering effects. Another major active ingredient found in Red Ganoderma are triterpenes, called ganoderic acids. Preliminary studies indicated that ganoderic acids help alleviate common allergies by inhibiting histamine release, improve oxygen utilization and improve liver functions. Triterpenes are bitter in taste and the level of the triterpene content contained in a product can be determined by the bitterness. Regular consumption of Red Ganoderma can enhance our body's immune system and improve blood circulation, thus improving better health conditions. Generally, Ganoderma is recommended as an immune modulator and a general tonic. 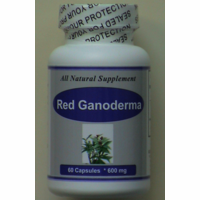 Red Ganoderma is also used to help treat anxiety, high blood pressure, hepatitis, bronchitis, insomnia, and asthma.